Migrating birds fly in a V-formation to take advantage of the aerodynamic effects of flying behind another bird. Remarkably, birds take turns at the front despite no obvious benefit to the individual. A new study explains why they do it, and why cooperation can be a powerful evolutionary tool. Last year, scientists from the UK's Royal Veterinary College put out a study showing the degree to which echelon formation, or V-formation, can confer energy savings to trailing individuals in a flock of migrating birds. The effect, known as aerodynamic wash-up, happens when birds take advantage of updrafts created by the flapping wings of a preceding bird. As the study demonstrated, flying in a V-formation is just as much about flying in the right place as it is about flapping at the right time. But what Royal Veterinary College study didn't explain was why birds voluntarily choose to fly at the front where there's no aerodynamic advantage to be had. This is no small matter. Long-distance migrations are extremely grueling, resulting in higher mortality rates than at any other time of the year. Among greater snow geese, for example, mortality during the autumn migration is at about 5% for adults and a whopping 35% for juvenile birds. These deaths occur on account of compromised immune systems, starvation, and dehydration, but it's safe to say it's also due to the intense physical demands placed on the birds during migration. On the face of it, the so-called "selfish gene" hypothesis would suggest that birds should be self-centered and refrain — or at least minimize — the amount of time they spend up front. But as a remarkable experiment conducted by Bernhard Voelkl and his colleagues from the University of Oxford's department of zoology has shown, birds cooperate to deal with this "social dilemma" despite the very high cost of migration. To figure out why birds do it, the researchers studied the flight behavior of a flock of 14 juvenile Northern bald ibis during a human-guided autumn migration. 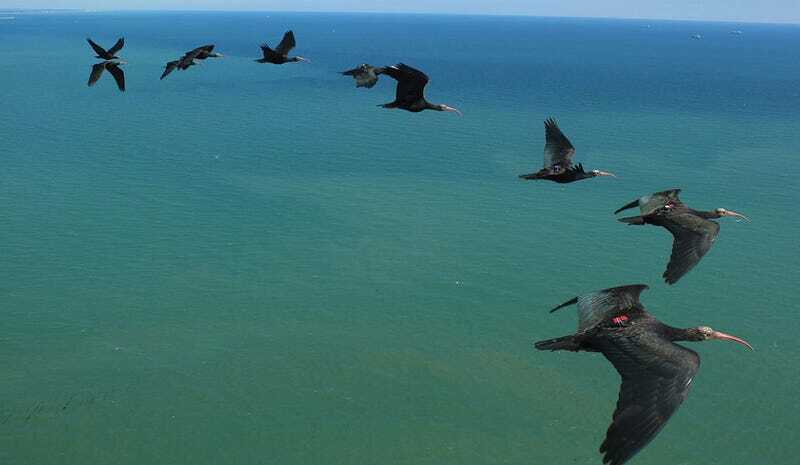 Each of the ibis were equipped with a high-precision GPS device allowing the researchers to track their behavior during flight in the first investigation to monitor the relative position of birds in relation to each other during free-flying migratory flight. Image courtesy of Markus Unsöld. By carefully observing the flock, the investigators learned that the amount of time a bird is leading a formation is strongly correlated with the time it can itself profit from flying behind another bird. Incredibly, the birds often worked in pairs, matching the time they spent in each other's wake by taking frequent shifts in the lead position. The researchers watched as the birds frequently changed positions, flying in formations of two to 12 birds. Overall, individuals spent an average of 32% of their time behind another bird, and a similar amount of time leading a formation. Image courtesy of Johannes Fritz. Clearly, the birds are taking turns and benefiting from this arrangement. But why? The researchers say that this cooperative flight pattern increases the success of direct reciprocation. Using game theory, they argued that non-cooperators, when meeting another non-cooperator, earns less than when dealing with a cooperator (i.e., the snowdrift game). Similarly, they argue that repeated sessions of in-wake flying encourages cooperation, writing that "the more often two individuals interact in situations where they can cooperate, the higher the potential gains of mutual co-operation." Moreover, the potential gains from continued cooperation are substantial. Studies have shown that altruistic acts are likelier when there's a high benefit to the receiver in relation to the costs for the donor. By working together, a flock of birds is greater than the sum of its parts. By not being selfish, individual birds can reap the collective advantage of aerodynamic wash-up, while also allowing for larger flocks, which result in yet more time for an individual to be in a backdraft situation. This study is a beautiful demonstration of how genomes and behavioral traits often need to be understood outside the context of an animal's immediate phenotype. When it comes to evolution, it's clear that individuals can benefit without being "selfish." Read the entire study at PNAS: "Matching times of leading and following suggest cooperation through direct reciprocity during V-formation flight in ibis".